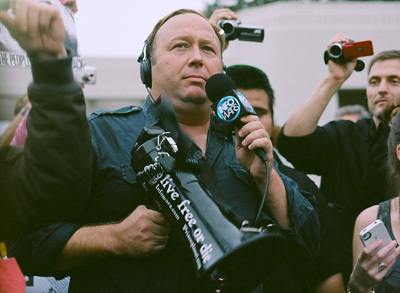 Alex Jones/Sean P. Anderson via Wikimedia Commons. The families of shooting victims at Sandy Hook Elementary School in Newtown, Connecticut, are entitled to see business and marketing documents of a radio show perpetrating a theory that the mass shooting was a hoax, a Connecticut state judge has ruled. Judge Barbara Bellis ruled Friday in a defamation suit against radio host Alex Jones and the Infowars radio show, report the New York Times, the Hartford Courant, Courthouse News Service and ABC News. Jones has testified in an unrelated case that his operations made more than $20 million in 2014, according to the New York Times. Mattei, of the law firm Koskoff, Koskoff & Bieder, represents six Sandy Hook families and a former FBI agent who was a first responder. Mattei said the plaintiffs have been subjected to harassment and death threats by Jones’ followers. The case is Lafferty v. Jones. Twenty children were among 26 people killed in the 2012 shooting by Adam Lanza, who also killed himself. Another suit has been filed in Texas on behalf of two other Sandy Hook families. A lawyer for Jones maintained that his speech is protected by the First Amendment. Another lawyer said Jones was considering an appeal. The second lawyer, Marc Randazza, said Jones had concluded that Sandy Hook was not a hoax after investigating the issue. “The allegation that he somehow spun up a harassment campaign against the parents is a lie,” Randazza told the New York Times.